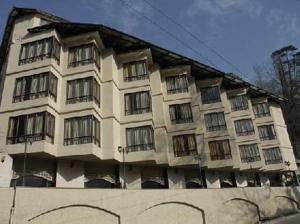 Mapple The River Crescent Resort lies against the backdrop of Manali's snow-capped mountains and scenic Beas River. It offers a pure vegetarian restaurant, as well as free internet and parking. Manali, also known as The Valley of Gods, is 48 km from Bhuntar Airport. Attractions such as Himachal Pradesh and Hidimba Temple are within 3.1 km of the hotel. Decorated in neutral colours, the air-conditioned rooms at Mapple River Crescent are equipped with a flat-screen satellite TV and sofa. A minibar and personal safe are also included. Recreational activities at Mapple include river rafting, skiing and mountain biking can be arranged at the tour desk. Guests may also make use of the hotel's laundry services and 24-hour room service. A daily buffet breakfast is served at Elements restaurant, while Neptune de Bar has a wide selection of cocktails. Freshly baked pastries and coffee can be enjoyed at Cafe de Mars and Doughnuts. Free! One child under 5 years stays free of charge when using existing beds. One older child or adult is charged INR 2000 per person per night in an extra bed. Maximum capacity of extra beds in a room is 1. Any type of extra bed or child's cot/crib is upon request and needs to be confirmed by the hotel. Supplements will not be calculated automatically in the total costs and have to be paid separately in the hotel.